The rare book was auctioned by EBTH, an online auction house. The starting bid was $1, but in the final moments of the auction the bids began rapidly increasing in mostly $500 increments. This is not a record for the sale of a first-edition Book of Mormon. The record sale for a first edition was actually $1 million dollars set in 2006. That book had a significant historical connection that drove the price up. The winning bidder for this most current sale was a private collector, according to EBTH. The first edition Book of Mormon, printed in 1830, The printing of the original book was overseen by Jospeh Smith who contracted with E.B. Grandin in Palmyra, NY for its production. Antiques Roadshow in 2013 featured an 1830 Book of Mormon. Rare book specialist Ken Sanders said, “It is not technically the rarest of the editions of the Book of Mormon, but for LDS people, it’s the one that everyone knows and understands and wants.” Today the Book of Mormon is now read by millions of people in over a hundred languages. Collectors who can't afford to buy an original copy need not fret. 1830 Book of Mormon replica copies are available. 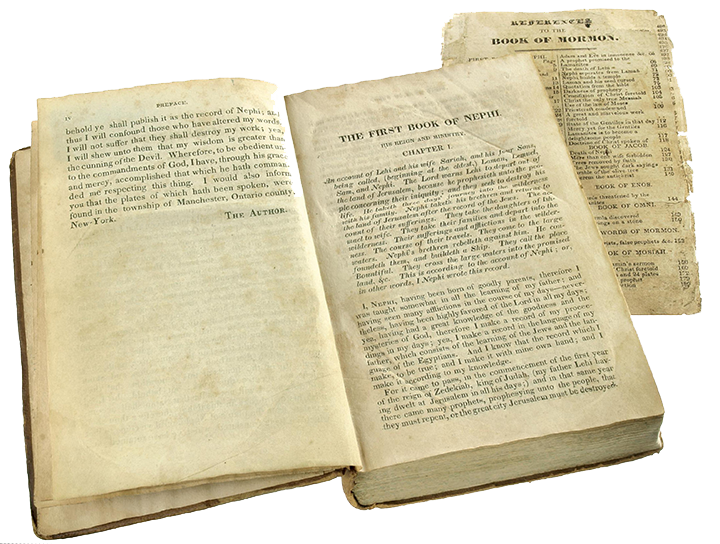 These replica Book of Mormon copies are created using the same original text, including printer mistakes such as misprinted page numbers.